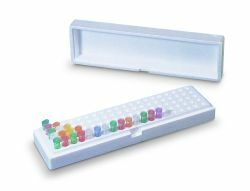 Made from recyclable, expanded polystyrene, this box is ideal for freezer storage of enzymes and other delicate samples. alphanumerically labeled, it will hold one hundred 1,5/2,0 ml tubes. A finger notch on the side aids in opening the box. Measures 340 x 97 x 64 mm.